After almost three weeks of traveling through India and 35 hours of transit getting back, I was ready to come home. Surprisingly, I found myself missing very little of my treasured New York lifestyle. Though not necessarily in this order, I missed long hot showers (of course), my family and friends, Sarah, potable water, playing chess, fast and available Internet, my guitar, and good wine. But other than that, I missed almost none of the other American accoutrements. It was the most patriotic I've ever felt walking through customs and hearing the burly customs officer say in his thick Brooklyn accent, "welcome home." Never before have I felt the value of U.S. citizenship, what that means to the rest of the world, and the extensive resources that my country has as its disposal should it ever need to find me in some compromising situation abroad. 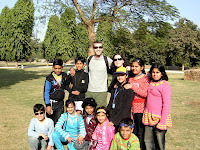 Although I have always been down on the spirit of capitalism that pervades this country, going to India very much reminded me that it was business that shaped modern life and the comfortable middle class in which I was raised. My biggest complaint about capitalism is that it seems largely devoid of altruism or certainly mechanisms which inspire successful corporations to be altruistic . Our system is balanced by competition that we engender, rather than any sense of obligation to social parity. But it has made me think that becoming financially successful is the best way to help other people and make some sort of marked impact on the world. Whether I have the tenacity or taste to do that, is another blog post. For the first time, New York seems quiet. And clean. The car lanes are luxuriously wide and cab drivers amble over the highways gently in blissful reverie. The sidewalks seem devoid of people and the peace and quiet facilitates my post-travel introspection. I am still haunted by those small faces that looked up at me with such devastatingly beautiful eyes pleading for a little help. I don't know what to do with that. Except to maybe understand my small place in the vast world a little more clearly and what makes life essentially valuable. Walking through the gates of Chowki Dhani at night, we plunged into a sparkling fantasy world of Indian culture -- a manufactured theme park devoted to Rajasthani life. Spreading out over a few acres were women performing traditional Rajasthani dances, elephant rides, palm readers, puppet shows, magicians, jewelry and textile shops, acrobatic feats, fire pits, and mud huts serving food. It was filled with Indian families, many of whom were presumably tourists, walking around with broad smiles while children played happily. Jean and I looked at each other darkly realizing that yet again our guide had failed us. What was the attraction of Chowki Dhani? Why was it filled with so many fat Indians looking amused and contented? By Western standards this simulation was the exact opposite of the gritty, real, spiritual India we had sought out. So why did every Indian we talk to rave about Chowki Dhani as if it were the happiest place on earth? And then it occurred to me that for them maybe it was. After traveling through the exposed poverty and burgeoning industrialization of this country, we had reached the Indian utopia. A place where people were not allowed to beg for money or hawk their wares aggressively. A respite from the outside world of beggars, poverty, and starvation. A sanctuary where tradition is honored, all-you-can-eat food is in abundance, and people are encouraged to be joyful in the fresh open air of the countryside. Two hundred rupees (about five dollars) bought shelter from all the ills of Indian life. It was no wonder that Rajasthanis had such high regard for this carefully manufactured foreign society that so closely mimicked their own. Sitting on the floor eating off of banana leaves, I was slightly sickened by the sheer abundance of food. The waiters kept dishing more food on to my leaves despite my protests and I couldn't help, but think of every starveling I had seen as my belly grew full and uncomfortable. My guilt increased as the food piled up on my plate soon to be thrown out into the garbage. We left soon after having nothing more to gain from Chowki Dhani. My nephews would love the clean, playful spectacle of this world. A privilege that most Indians will never know. 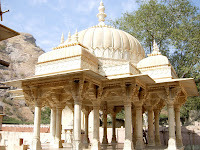 Jaipur was founded in 1727 by the astronomer king Sawai Jai Singh. 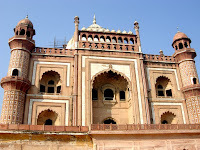 Much of the city is constructed of pink stucco meant to look like the classic Mughal red sandstone although, in reality, it more closely resembles a light peach with ornate brown trimmings. It's said that the city was repainted pink during Prince Albert's 1876 visit to reduce the glare of the desert and that the prince was so pleased, the city continued to do so, thus earning its famous sobriquet: "The Pink City". The Pink City has a completely different look and feel than Delhi in the north. 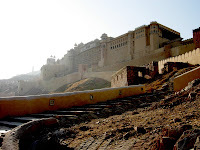 Being in the state of Rajasthan which is largely desert, the climate is drier with cool winds that blow through the city at night. There is a more pronounced Mughal feel to the architecture and the colors of the city are the light pastels of the desert. Brightly painted elephants and camels roam through the city pulling wooden carts or transporting passengers decorated with elaborate jewelry and noserings. At night over the city, Rajasthani drums drift across the breeze accompanied with joyful singing and puppet shows. Having been subject to the whims of our young guide, Jean and I were resolved to have a better idea of what we wanted to see our second day in Jaipur. We drove past Albert Hall in the rather wilted and disappointing Ram Niwas gardens and, fending off further suggestions, continued to the City Palace. 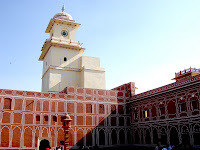 A relatively recent collection of courtyards, gardens, and buildings, the palace also had several good museums showing a history of Rajasthani dress, textiles, and weaponry. One building of note, the Hawa Mahal or Palace of Winds, includes harem chambers where special screens built into the facade allowed royal women to view the marketplace in the street below without being seen. I found it chilling to see these spaces where women were herded together and confined by such powerful rulers unable to interact with the world around them. We left our guide to walk around the bazaars and shop for a while walking up and down the streets constantly bombarded by offers and requests to just look around without (of course) any pressure to buy. It was here that I first noticed that I couldn't stand still for even thirty seconds without someone approaching me to talk. The conversations usually started the same way. People standing in storefronts would look me up and down gauging how lost I looked and then ask me where I was from followed with questions about America. 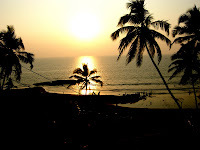 Then they would try to be of service hoping to pick up a tourist commission or a few easy rupees. I couldn't be rude to anyone, but slowly my sense of privacy and personal space began to erode. After a dinner of Dal Peshwari -- yellow lentils cooked Punjabi style garnished with clarified butter -- our guides suggested taking us to Chowki Dhani, a recreated Rajasthani village on the outskirts of the city that I had read about. Questioning the authenticity of the place, I had my doubts, but our guide insisted that he had been there "thousands of times" and that it was one of the best places to go in Jaipur. 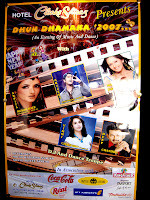 Considering that local nightlife consists almost solely of going to the cinema to watch Hindi movies, we were hardly in a position to decline. The next morning, Afsar drove us over to Fatehpur Sikr, a city built by the Mughal conqueror Akbar the Great in 1571 (son of Humayun). Intended to be the seat of his new government, Akbar only inhabited the city for 8 years before abandoning it due to lack of water. But the entire city is remarkable in its urban planning and well thought out design and architecture. Afsar quickly found us a trustworthy guide and sent us on our way to tour the city and learn its history. 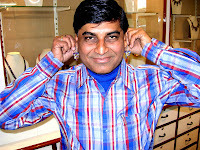 Afsar is a perfect example of a type of Indian that tries desperately hard to please his customers. 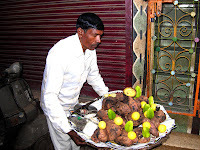 Polite to a fault, he refused to name any price for his services, instead giving us the very Indian "as you like." "As you like" is actually extremely clever price structuring, as Westerners have generally very little idea of how much personally chauffeured tour services should cost and inevitably overpay whether out of a sense of guilt or aversion to seeming cheap, especially in the face of such squalor. (Plus, if you try to low-ball an Indian, they will shyly let you know that you're way out of their price range.) 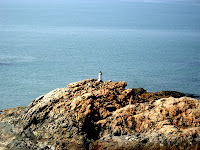 Afsar's mantra was, "If you are not happy, I am not happy" and insisted if we were dissatisfied, we could pay nothing. And honestly, I believe he lived by this creed. Every time I got in the car, Afsar made sure to open the door for me. "It is my pleasure." And it really was. It was his pleasure every single time he opened that damned door for me which, despite his best efforts, slowly ate at me. He would have done whatever it took to make us happy, which was maddening in its own way, but all on the assumption that we'll pay more if we trust and like our guide. And, of course, he's completely correct. A refreshing change from the street beggars of Delhi, you had to admire Afsar, working his way through graduate school (supposedly) and we completely wanted to make him happy. Akbar was what they call a polymath--an amazing human being with a variety of skills and talents. He collected literature and art from around the world and invented the first prefabricated homes and movable structures (essentially invented the trailer park). He was also one of the first leaders to tolerate other religions and refrained from destroying Hindu temples during his reign, as well as hosting religious debates. Fatehpur Sikr completely reflects Akbar's tolerant attitude and inventive genius including early forms of plumbing and air conditioning in the middle of the desert. Akbar had three wives: one Hindu, one Muslim, and one Christian. And he built separate places for all three within the city, the largest built for his favorite wife -- the Hindu. Akbar had this idea of uniting his people under one rule through religion, so he tried to create a fourth religion that combined elements of Hinduism, Islam, and Christianity with him as a sort of demigod figurehead called the Din-i-Ilahi or "Faith of the Divine". It didn't exactly catch on (any Akbarians in the house? ), but you have to admire the guy for trying to unite factions that continued to bloody Indian soil over the next couple hundred years. Carved columns and other elements throughout the city have subtle nods to each religion weaving their symbols in connection with one another. A couple other details worth noting: After five hundred years or so, you could still see flowers painted clearly on the walls -- sort of an early wallpaper. They looked charming, the kind of print one might have seen in the 1950s. Akbar also combined life-sized Parcheesi with music and dancing girls out in one of the entertainment squares. You can still see place designators carved into the marble floor. Akbar was also a fan of elephant fighting and has a tomb dedicated to one of his favorite elephants. A main part of the city is a mosque called (as in Old Delhi) Jama Masjid. Despite three wives and many more concubines, Akbar had trouble conceiving. After a blessing by a Sufi Saint Salim Chisti, a wife bore him a male child, the later Emperor Jahangir. This saint has a beautiful tomb in the mosque where you're asked to "donate" some money to clothes for women and children by buying some cloth and red thread. In the mosque, you drape the cloth over the tomb and make up to three wishes tying each red thread on one of the tomb's window carvings. If you don't tell anyone, the spirit of Salim Chisti is said to make your wishes come true. After an unmemorable lunch (many Indian guides seem to base their lunch and tour choices on other tourists' tastes unfortunately as we learned), Afsar insisted we go on a textiles tour, not coincidentally at his good friend's shop. Ah, here was the rub. I knew Afsar couldn't be completely clean; this was a common "scam" I had read about. We almost got sidetracked with a similar proposition in Delhi, but held our ground. Afsar being so nice, however, we relented. Indian rug and jewelry dealers have selling down to a fine art. It's a cliche to say that Indian or Middle Easterners are the shrewdest bargainers in the world, but I was off the chart impressed. First they did give us a short tour of workers weaving thread through a loom chanting softly to each other so that they know where each other are in the process and to create a subtle working rhythm. The actually human labor that goes into a hand woven rug is so immense, we couldn't help but be impressed. Then our host took us back to the "dealership" where he had rugs that ranged from high end Mercedes to junky Hyundai. They had rugs of silk so soft you could drape them around your shoulders like a cape. And he was relentless. Telling us the prices weren't negotiable, he set to work and before we knew it Jean had a bought a lovely rug that they were shipping to Singapore. In hindsight we thought we may have been suckered a little too readily, but the reality is that these rugs cost a quarter of what they cost in New York. So even if Jean paid too much, she's still getting a great deal and a beautiful rug. Already having nice factory-made synthetic rugs, I declined over and over and over until the size of the carpet offered was no bigger than a doormat. But I held firm. We had fallen to the first of many Indian selling tactics. Jean expressed some interest in seeing a similar marble shop, so we took a short tour on how craftsmen carve marble, but escaped with our wallets intact. 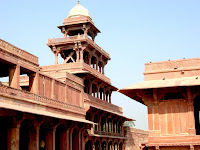 We last went to Agra Fort, where Akbar moved after Fatehpur Sikri dried up. Agra Fort is an enormous structure built of red sandstone started by Akbar and finished by his grandson Shah Jihan, who built the Taj Mahal. 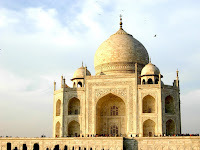 Shah Jihan is said to have been imprisoned by his son in one of the towers for eight years where he looked out the window at the Taj Mahal, the tomb of his beloved. We boarded our next train in the evening that would take us four hours west to the desert city of Jaipur in the state of Rajasthan. As an American in India, I now know how famous people must feel. Everywhere I go I'm besieged by people wanting to talk to me. If I stand in one place for more than a couple seconds, people ask me where I'm from. Finding I'm from America, they are incredibly impressed and tell me what a wonderful place I'm from as if congratulating me on my last movie. I can go no where without drawing stares and most people want to take pictures with me to show their friends. I retreat to the remote beaches (like so many stars) wanting to get away from it all and even here I have people asking to take my picture, shaking hands or putting my arms around them as if we are long lost friends. If the conversation lingers, the fans might even broach the nirvanic invite to a family dinner or out to a club, as if we might really become good friends and then... who knows? The possibilities then are limitless. It's no different here I realize. People crave that same kind of association with fame and the upper crust. We too have our autograph seekers; people so proud to have posed in photographs with famous people they mount them on their walls as if showing off good friends. We too have that secret fantasy that maybe if we impressed George Clooney just a little in a chance meeting, he'll want to come home with us to dinner or out to a club where we'll drink and smoke together and then... who knows? The possibilities then are limitless.